Ales of the Riverwards: Farmhouse Festbier: A Fall beer without Pumpkins or spices? Farmhouse Festbier: A Fall beer without Pumpkins or spices? As of this posting its officially Fall, maybe it wasn't on brewday but you have to think ahead you know? For alot of craft beer drinkers that means Pumpkin beers, and lots of them, the more the better some might say. I guess I'm not "some", sure I'll have one or two when the leaves start to change but most of them just don't do it for me. It's not that I don't like Pumpkin, I am actually a fan I love Pumpkin pie, what I don't like is the heavy handed spicing so many brewers tend to use, and don't get me started on Pumpkin beers released before Pumpkins are even harvested. Libby's canned Pumpkin is actually made with Squash (Dickinson's Pumpkins). I'm sure Dickinson's are good, but most people are picturing their jack-o-lantern Pumpkins in their beer. It really boils down to Spiced beers in general for me, they come off as a muddled mess to me, and believe me I have tried brewing them and tasting many, I prefer my spice to be yeast driven. So no Pumpkin beer being brewed, and no Holiday spiced beers, what to brew for the fall weather? My goals for this batch were, something yeast driven, Saison/Farmhouse-y, something earthy with a slight malt presence and a deeper amber color, some funkiness from the yeast (without Brett, although I may bottle dose a 6-pack) and a citrus component to tie it all together. I have been playing with a method some are calling "Capping the mash", meaning saving your dark roasted malts and adding them prior to vorlaufing. The idea here is that you will get the color you're looking for without all of the roast flavors/aromas which is exactly what I am going for with this beer. 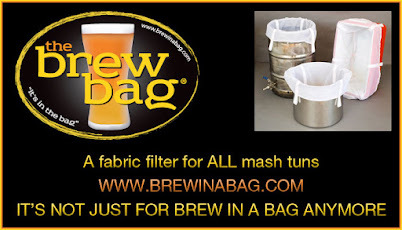 This method its perfect for Dark Saisons or Black IPAs in my experience. Dark runnings after capping the mash. This will also be my first time trying out WLP585 Belgian Saison III, It sounds like an interesting strain that may bring out some of the biscuity flavors of the Victory malt to go along with some tartness that the yeast apparently throws off. Other than I just wanted to try a new Platinum strain for the hell of it. To help dry the beer out, and hopefully add a more Rustic feel to the beer, I added a boiled mixture of the Golden Blossom honey (a blend of White Clover, Orange Blossom, and Sage Buckwheat) 48 hours into fermentation. I do my sugar additions in all of my Saisons in the fermenter to ensure the yeast ferment the complex malt sugars before they feast on the easy to ferment simple sugars. In addition to that, when I add the sugar I am usually at the point that I want to ramp the fermentation up a little higher and adding the sugar tends to do so. Misc: 60 seconds of pure O2. Philadelphia filtered tap water, no salt additions. 12-16-13 Tasting Notes from the can.